Tune into Radio Carly: My grandparents' last trip. Around the world, twice. Once for free. My grandparents' last trip. Around the world, twice. Once for free. You may remember earlier this year, my grandfather, Poppy, passed away aged 91. My grandmother, Nanny, passed away in September 2008, she was 86. They had been married for 66 years - they wed in 1941, in the middle of World War Two. Their wedding photo is above. Isn't it beautiful? The simplicity. The formality of the army uniform. The tiny posy my Nanny held. And the strength of the way they held each other's hand. Their love looked urgent. Can you imagine spending almost your whole life together - participating in a world war, raising two children and being a grandparent and great grandparent to five more children, moving countries and seeing so much change? They did. I wish I knew more about the change they've seen, I wish I'd listened more. Three months ago my Dad picked up my grandparents' ashes from the funeral home. Four years on and they're together again. Dad posted the ashes by seamail back to England, their homeland. My Aunty will collect them at the other end. 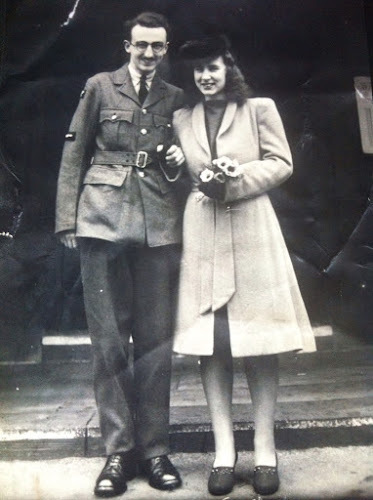 When I went home for Poppy's funeral, I found it incomprehensible that my grandparents lived so long and had experienced lot in their lives, yet the amount of possessions they had only filled my parents' spare bedroom. Some suitcases, a lot of filing boxes filled with history of military service by my grandparents, great grandfather and great great grandfather, Poppy's poetry and Nanny's photo albums, and tins filled with precious mementoes - my Nanny's jewellery, too good for her to wear each day, a pen from Buckingham Palace and war medals from three wars. And now them, strength in unity, as tight as that hand hold in their wedding photo, weigh a mere three kilos, albeit in a plastic container. It's hard to believe that two lives over 90 years can amount to such little stuff. Last week the ashes were returned to my Dad. They'd been to Amsterdam on a boat, and back to Australia again. They didn't make it to England. My grandparents moved to Australia in 1987 for the warm sunny weather. I joked to my parents they realised the weather in England was perpetually gloomy and so they wanted to rest in Australia. Dad went to the mail centre to talk to Australia Post about the returned ashes. He said his parents needed to get back home after all these years. Australia Post didn't charge Dad for the second journey. Nanny and Poppy would be chuffed at a free trip! Free! They're now on an aeroplane, express to England. Home to rest. My grandparents lived a frugal life. But they saved enough to go on a holiday almost every year. Here in Australia they would go to Mount Beauty, enjoying the countryside and the sunshine and the company of their hosts and other aged people. I think they travelled overseas from England to Europe a little too. At my Poppy's funeral, I held my Dad's hand and saw his eyes well up as the celebrant talked about how my grandparents worked hard to afford my Dad and his sister a holiday to Scarborough each year when they were young. I imagined the family by the sepia-toned seaside (I had only ever seen sepia photos), children with buckets and spades, and parents sunning themselves, calling it a day with treats of icecream and bottles (or "bockles, as my Dad pronounces it!) of lemonade. I think they were happy times. My grandparents will reach England in around seven days, their final trip to their favourite holiday destination, Scarborough. I imagine they'll be arguing the whole flight, like they always have done, Nanny nagging at Poppy to move his cup away from the edge of the table, and Poppy saying "shutup Joan", in his quick tongued midland accent. They'll be wearing their best for the trip, they always got dressed up to go out, Poppy even wore a tie to the shops. Nanny will be writing letters home - to her two homes - England and Australia, and she'll be scoffing a second helping of dessert, just like me. As they arrive in England, Nanny will do the Royal Wave for pomp and ceremony, like she did to punctuate many 20 minute car journeys. My Aunty will collect them from Telford, and she'll scatter them in Scarborough someday. I do hope they'll still be holding each other's hand tightly until they reach the sea. Carly, I have teared up over my tea and toast as I read this poignant, heartfelt and most beautiful recollection of your grandparent's lives and their final journey. The physical evidence of lives well lived may not have occupied much space but it is obvious their full and rich time on this planet has left an imprint on those who loved them that couldn't be contained in a spare room or even one country! Thank you for sharing and for such a beautiful and reflective start to my day. Great story Carly, really liked this one. 66 years is a long time, isn't it? I hope Australia Post manage to get your grandparents there in the end. Sounds like a wonderful final resting place. Thanks Tania! I hope Aussie Post get them there too! Thank you so much for your lovely comment Chris. I'm glad we met through Nanny and Poppy. You never seem to talk about your Mum's side of the family or your South African heritage,there seems a little detachment there,do you know them at all? Hi Danielle, I have written about my Mum's South Afican heritage a little, but I never knew my maternal grandparents. My paternal grandparents lived nearby when I grew up. However I am in contact with some of my South African relatives on Facebook. It wasn't until this year that I spent time with both of my English cousins at once. Please don't think it's detachment - it is merely a situational/distance challenge. Wow Carly that was beautiful. A simpler time and life indeed, just as it should be. I hope we can all remember that the hand holding and the 2nd helping of dessert is really all that's important in the world. They sound like a lovely couple and lovely grandparents. You are very lucky and so we were they! I got a bit teary at the end -- such a beautiful story, so wonderfully written. definitely brought tears to my eyes. That was lovely Carly. We kept my Opa's (grandpa) ashes till my Oma (grandma) joined him. Then Mum wasn't quite ready to let them go, so for a few years they were in their plastic boxes in the house, under the Christmas tree at Christmas time until it was time to let them go. I love the idea that they are together just like your grandparents. Just goes to show that we really don't need very much "stuff" to be truly happy. Bless them....may they rest in peace together. I loved reading this beautiful post even though my eyes were filled with tears. I love that you held your Dads hand at your Poppys funeral.You would have been a beautiful strength for your Dad. I love how you write of family,reminding us of the importance of our older loved ones. I love that photo and I love this post. I still weep all the time about my Grandma. She died in 2010 but it seems like yesterday. Such a beautiful and moving post, Carly, a lovely tribute to their lives, memory and legacy. Gorgeous post Carly! And I love that photo - the hands so tightly held. Thanks for Rewinding.